February 3, 2013 By Katie P.
Alexander Campbell Hutchinson was born 24 April 1858 in Oakland Township, Pennsylvania to Ann Marie Jamison and William T Hutchison. “Cam” was the middle child of nine and and as a small boy they lived next door to his grandparents, two aunts and uncles, and nine cousins. I imagine many large family gatherings during his childhood. Cam worked as an oil driller and was often away overnight for work. On 14 July 1893 he married Loretta Alice Zillifro, daughter of Egbert Terwilliger Zillifro and Sarah Ellen Willis. They had eight children; five lived past infancy: Oscar Bower, Roscoe Campbell, Victor Harold, Cametta Marie, and Rose Ellen. On 15 April 1912 Loretta filed for divorce, which was granted on 25 September 1912 after paying the $15.79 in court fees. The 1940 census lists Cam living in the Butler County Home. Later that year, on 23 October 1940 at the age of 80, Cam passed away. He had been suffering from chronic endocarditis and chest pains. Cam outlived all of his eight siblings by at least 24 years. Cam is buried at the Concord Presbyterian Cemetery in West Sunbury, Butler County, Pennsylvania. Pennsylvania. Department of Health. Death Certificates. Bureau of Vital Statistics, Harrisburg. Pennsylvania. Butler County. Local Family Court in Butler. Divorce Records, Prothonotary, Butler. Pennsylvania. Butler County. 1860, 1880, 1900-1920, 1940 U.S. census, population schedules. Digital images. Ancestry.com. http://www.ancestry.com : 2012. 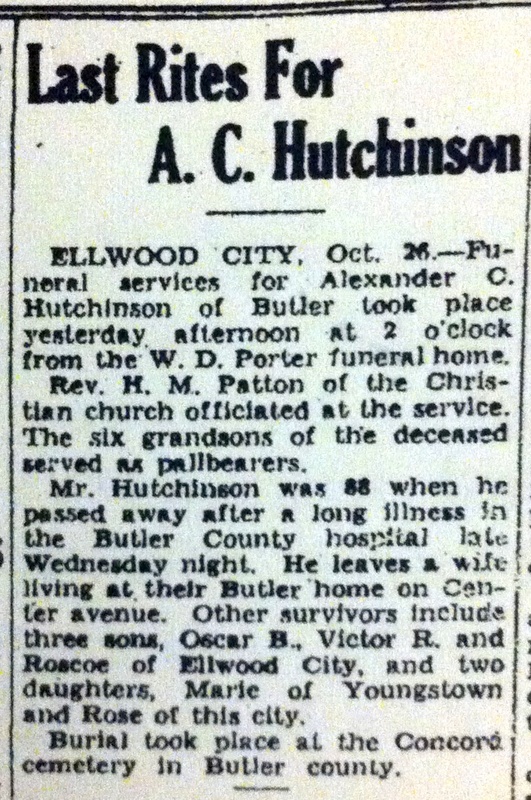 “Last Rites for A.C. Hutchinson.” New Castle News, 26 October 1940.